Android is one of the master pieces that Google has created for the users. It has became one of the most used mobile operating system and has seen a frequent updates in no time. If we compare the first final version of Android with the present day’s we can see that how far it has travelled now. Google announced yesterday, that they have implemented a new feature in their search engine that should help netizens to find their smartphones when they are misplaced or lost. 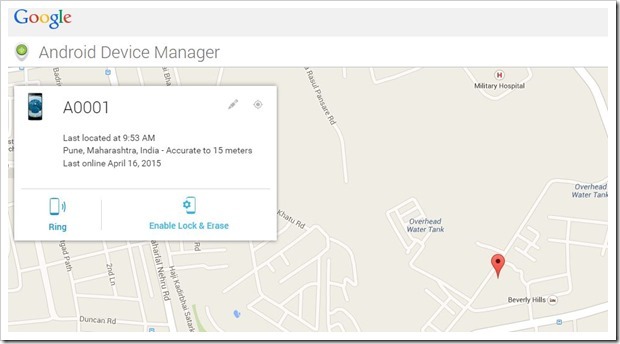 Google had earlier introduced a functionality called ‘Android Device Manager’ which actually served the purpose of locating your Smartphone without having any access to it. However, till now this functionality was not integrated with Google Search, which now has been! Almost all mobile manufacturers like Samsung, Sony, Motorola etc make use of Android Device Manager so that the user can find and wipe the data from the device if it’s stolen. Along with this it served other purposes as well. Like if you are not able to find the Smartphone in home then you can just ring it from desktop and locate it easily under bed or like that odd places. Now, the main problem here is that this feature can be accessed by logging into manufacturer’s site or Google account itself. But today Google has officially made this feature easy to access with the help of Google search! 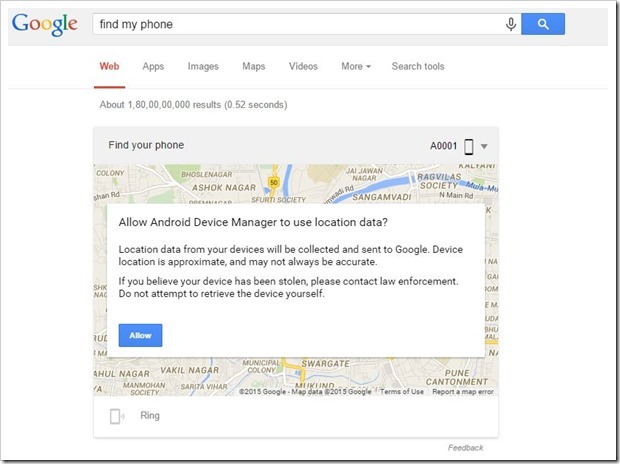 Now, you can find or locate your Smartphone just by typing ‘Find my phone’ in Google! If you have not configured your phone to allow Android Device Manager to use location data, you will see a message like this (as shown above). If you have already given access to location data, the search query will locate your phone (you may need to sign into Google account that is active on your phone). This is what you will see in Google Search then. The name of your phone, the time when phone was last located, along with the location in the maps. It will give you accuracy level as well. If you have misplaced your phone, just click on “Ring” and it will ring for 5 minutes, so you have time to locate the phone. In the event that your phone is lost or stolen, you can choose to remotely lock your phone and even erase the entire data residing on the phone so that no one can access it. This feature may be god-send in certain situations. Do a trial run with you phone and let us know if it worked for you!! "Now, Just Type ‘Find My Phone’ In Google Search To Know Your Phone’s Location! ", 5 out of 5 based on 1 ratings. On the flip side, just imagine the below : you are a Sales guy left office telling your boss that you are visiting a customer. Your manager types your number in Google to find you are home romancing your wife or in a movie theater with your girl friend. Or imagine you called your wife to inform that due to the meeting you will be late for dinner. Your wife finds out that the location of both your and your secretary mobiles are in a Hotel room. Good old days…..No more decent cheatings anymore. What I mean is the wife knows her hubby’s no. She also knows the secretary’s no. First she checks in google where her hubby is. When she gets the location as a hotel, she gets a doubt and cross checks the sec no too. That too shows the same location. Tried it works, it is amazing this feature.